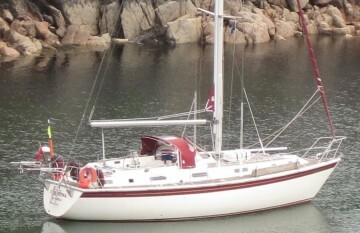 Superb condition and well maintained throughout her life with many replacements and additions by current owners. She is the original boat show model for her year. Generally lightly used, most recently having cruised west coast of Scotland, Irish Sea, Wales, southern Ireland and Cornwall. Sleeps eight in three cabins, two heads, one with shower. Engine replaced in 2004, all sails within past four years. Hull peeled and re-epoxied in 1999. Treadmaster decks in good condition. Recent batteries. Antifouled and ready to launch. A really spacious and comfortable yacht, perfect for family cruising and capable of serious passage making. Excellent headroom of over 6 feet in most areas. Would make an excellent live aboard choice for a cruising couple with all the comforts of home including diesel central heating. There is also an Aquatic DVD/CD/Tuner/I pod media centre (2013) available by negotiation. 12v system, control panel professionally replaced & rewired in 2012. Documentary evidence of VAT paid. Also original Westerly manual and all bills of sale from new. Headroom over 6 feet in most areas. Max cruising speed is around 8 knots.